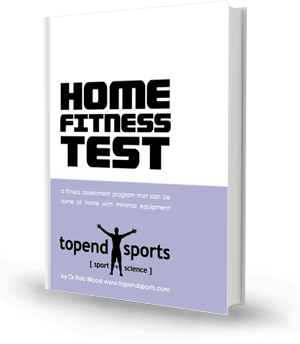 The following equipment is required to conduct the 10 tests in the Home Fitness Test. Unlike many of the more advanced tests used by sport scientists, these fitness tests on this website have been chosen so that little or no equipment is required. All the equipment needed are basic items that you can find around the house or purchase for low cost. There is some other fitness testing equipment in our online store. Areas around your home – a wall, step (or box) and clear floor space. Scales – bathroom type weight scales. Some types can also provide an estimate of your body fat percentage. Cloth Tape – measuring tape like used for sewing. Longer tape measures are suitable for measuring running distances and height, and the smaller metal tapes are for measuring girths. Ruler – just like you used at school. Timer - for many tests you can use a clock with a second hand, though some tests require a digital watch with a stopwatch function. Used in the running tests and the 1 minute sit up. Markers – marker cones (any object really), chalk or tape, used to mark out the starting and turning points for many tests.. Pen – for marking down your results.